The Two of Wands indicated your creative expression – controlling a situation through your ability to make choices which create balance, integration, comfort and harmony. Achievement in your business plans – your goals will be attained in work. Success and courage will bring happiness. With the correct negotiation, there could be a business partnership. An important contract, transaction or letter is indicated. You have completed the necessary work, your foundation is good – you are ambitious, progressive and willing to take the lead hoping to improve conditions. Experience the creative power of your emotions – good judgment and ability can translate your ideas into reality. An unusual and unexpected event will occur now – any conflict could bring loss. Maintain your balance as events arise that will test your ability to judge fairly. When you are in charge you are comfortable making decisions and will stand by them – you may not be able to give logical reason for your decisions, but you feel confident enough to act on them. You seldom turn to someone else for direction – preferring to do things in your own way and take responsibility for the outcome. Your greatest problem is your own boredom – this lack of a new direction or stimuli. Have a little more patience – organize and bring order to your personal life. Clarify things in order to prevent any misunderstandings. Do not allow anyone or anything to “dominate” your thinking for that creates imbalance. Move the way your body wants to, regardless of past learned patterns. You are capable of unfolding into great beauty if you follow you own inherent potentials. See who you really are as opposed to who you are supposed to be or where taught to be. Clear awareness of self is established through a peaceful mind and a calm heart. You stand now, with the world in your hands – yet, you find no contentment. You are bored. Your accomplishments have walled you in and the world you hold “appears” very small. You have become weary and can think of nothing more to do with your life. Your love of battle and challenge has left you with no satisfaction for your actual accomplishments after the fight has been won. You will have the energy you need to move in new directions now. Apply yourself – remain balanced and in harmony with the energy that surrounds you. Maintain equilibrium between your mind and your body, so that you do not act until you need to and this self-discipline, combined with your intuition – will bring success to your enterprises. Spiritual curiosity, wonder leading to choice and choice leading to more wonder. Alternatives for growth, a selection of potentialities, the entrance of “other” at the intuitive level. Recognition of choice, or alternatives and the action in relation to that choice. The quality of discernment. The world is calling you, infusing a spirit of adventure to see first hand what wonders await. The potential for true growth, real opportunity. Having realized the physical reality of the spiritual path, you have been offered and have accepted the mantel of initiate. Through this door you will never return. As indicator of your initiation, the Ace of Wands is your vow to take a vow, dedicating yourself to the path. 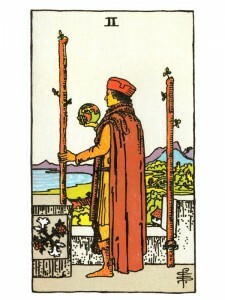 The Two of Wands is the vow itself, through which you become a bride/groom of the divine. Just as you must “mate” on the Physical, Emotional and Mental levels, so must you choose and “mate” on the Spiritual level as well. Oaths. Pledges. What two ideas are you bringing together in a new and different way? What are you planning to accomplish? What are you competent at? What conflicting desires do you wish to integrate? At what threshold do you stand? Next to Empress or Emperor: Opportunity is imminent – set your ideas in motion. Swords on all sides: New vibrations – be sure everything is in order. Next to Seven of Swords: Sort out your problems now – you are experiencing an unnecessary disturbance involving this situation. In the first position: Lifetime will involve a conscious selection from spiritual path alternatives, with the ability to help others travel with and behind you as your movements will be open an obvious, although they may be subtle. Your disciplines and observations in which you participate with the Divine will most likely be shared by others. In the second position: Your ability to see the gates open and chose the correct one, makes for efficient worldy progress. Your sensitivity to your Karmic Contract brings you the supplies needed to build your material world. Spiritual commitment has enhanced your material progress. In the third position: Yield to your sense of wonder and spiritual alternatives will become very clear. The disciplines, forms of practice and observation, are presenting themselves for review. Your guides will speak very clearly now. Take an oath. In the fourth position: Passion here is for the path itself with its myriad choices, for what the journey brings the moment it is engaged – a passion that surpasses all other loves. But, this love does not crowd out other loves. It requires the opposite, a multi-faceted experience of personal and universal love. In the fifth position: The mind begins to recognize itself in the “other”. A conscious decision to seek further knowledge, a hunger for the wisdom that comes with closer union with God, the very same wisdom that requires a deeper understanding of self. This choice places spiritual matters at the pragmatic forefront of your mental processes and shapes all decisions from this point on. Raising the standards of your priorities to the highest levels. In the sixth position: As you move toward the center in your Spiritual Plane, your relationships and creative activities in your Emotional Plane will be pulled into line as well. While all of this centering is positive, it generates change which must be accommodated. In the seventh position: You are pulled toward your true destiny by your Karmic Contract. This next year you must make major commitments to honor and reclaim as an adult that sense of mystery and awe that was natural in you as a child. In the eighth position: Content as you are with the now, nevertheless you approach every moment as an opportunity not to be missed. The promises being made now are promises made to yourself, but they may take the form of pledges to anyone/anything you admire. In the ninth position: The heart begins to recognize itself in the “other”. This is where the “self” falls in love with the “Self”. Your greatest desire now is to taste the thrill of the journey. In the tenth position: You have completed your novitiate and will be exposed to deeper lessons; greater demands will be made. Remember you have signed up for greater knowledge/ responsibility. You are expanding through the magic of identification. A spiritual engagement/marriage.